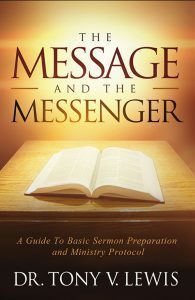 “The Message and the Messenger” may be the first and last book you will need on basic sermon preparation. Written from a scholarly but pastoral perspective, Dr. Tony V. Lewis, President of Christian Bible Institute and Seminary, provides a great concise guide in preparing not only the sermon, but the preacher, for a lifetime of ministerial service from the pulpit. In the opening pages of the book, Dr. Lewis writes, “The call to ministry and to preaching is also a call to preparation and a call to study.” This book gives the reader spiritual, academic, and practical ways in which they can prepare themselves for a lifetime of preaching. From Jabez Publishing House https://www.cityofjabez.com, is also available from www.tvlewisbooks.com. The eBook can be purchased from FaithLife https://www.ebooks.faithlife.com for $11.37 More information on The Message and the Messenger can be found at https://www.cityofjabez.com. Dr. Lewis has earned both Bachelor of Theology and Master of Divinity degrees, a Ph.D. in Theology, and a Doctorate in Christian Counseling. Dr. Lewis is a Certified Christian Counselor, Anger Management Specialist, Integrated Marriage and Family Therapist, Christian Chaplain and Biblical Life Coach. He is also the author of The Wife He Wants “What A Godly Man Seeks In A Wife “and Word Potential “Essays On The Faculty Of Spoken Words”.